Robert Rollin, a native of Brooklyn, New York, began composing at age 8 and was soon recommended by conductor Erich Leinsdorf for a special composition scholarship at Juilliard. Graduating Phi Beta Kappa from City College and with a doctorate from Cornell, he studied under Mark Brunswick, Ravi Shankar, Robert Palmer, Karel Husa, Elliot Carter, and György Ligeti. He has been recognized with annual ASCAP awards consecutively for two decades, and has held many important awards, post doctoral fellowships, and grants, including the Ohio Governor’s Award for Creative Excellence presented by the Honorable Richard Celeste in a public ceremony. Robert Rollin recently retired from the Chair of Composition at the Dana School of Music. 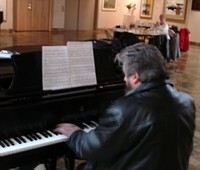 His guest appearances as a lecturer, guest composer, and performer include visits to South Africa, Australia, New Zealand, Scotland, Mexico, Ukraine, and throughout the United States. He is active locally as a music critic for www.clevelandclassical.com, and he is also a coordinator of the New Music Society and the New Music Guild, Inc.. He directs the Dana New Music Festival; and, in addition, he directs the Festival Chamber Orchestra, a professional group. His works are published by Subito Music Corporation (Seesaw Division), E.C. Schirmer, Bourne Music Publishers, and Acoma/Nambe Editions.